It wasn't yet noon but the sun was bearing down on the Northern California peninsula. Indian summer, we always called it. Hot days ripening tomatoes with a frenetic madness that no home canner could hope to keep up with. Cool nights, wilting the pumpkin leaves and soothing the newly planted pea seedlings. I tried not to think of the temperature, of how hot it might get today and, instead, ducked under the next green awning. Sapphira's stall. We talked kids, weather, gardens. I picked out some lettuce, peppers and cauliflower. Cucumbers, cucumbers? I found a box nestled between the potatoes and greens. At $3 a pound, though, and cucumber relish on my mind, I couldn't justify them. Her heirloom tomatoes were on sale. $2 a pound. Beautiful orange, red and purple. I ogled them but with a bursting front yard garden, I didn't exactly need more tomatoes. Except . . . here were "softies", or so she'd labeled them. $1 a pound. I cradled a slightly mushy San Marzano in my hand. I smelled pasta sauce for dinner. With a bag full of soft tomatoes, I loaded my market cart. "Wait," Sapphira called out, "will you take some onions or some kale?" Then she grinned. "Cilantro?" Waving the green bunch toward me, I accepted. Who with a yard, and now a cart, full of tomatoes, would turn away cilantro. Nothing and I do mean nothing tastes better than homemade salsa. I thanked her and marched on. I passed the organic apple farmer as we'd just gotten four bags of ultra local apples off of Freecycle. Strawberries were at the peak of their season. I loaded up with a half flat - and thanked the vendor when she knocked $2 off my total, just for being a regular. I planned to pull out the dehyrdator this afternoon for January strawberries in my granola. Toward the end of the market was another favorite organic farmer. Nunez Farms. I did still want to make cucumber relish, I thought, and decided to take a peek. Their cucumbers were only $1 a pound. They soon found a home in my market cart, amidst greens and berries and a jar of honey. I had parked on the other side of the bakery. In the past, I had savored their loaves of Levian and sourdough. At $5 a loaf and with Artisan Bread in 5 Mintues a Day in my back pocket (or on my shelf at least), though, I was so done with purchased bread. I'd recently invested in bulk flour and could knock out a beautiful loaf of bread for well under a buck. Still, I paused when passing the pastries. The french bakers with their charming French accents could keep their goodies - but I might steal an idea or two for this weekend's breakfast. I packed my bags in the trunk and counted my cash. I'd spent less than half of what I used to spend when I locavored on autopilot. As I shifted the car into drive, I thought about my grand total . . . and about an article I'd recently read on the new White House farmers' market. Many laud Michelle Obama for the efforts she's made - from planting an organic garden on the White House lawn to opening the new farmers' market with a brimming market basket. Many laud. But many others giggle over the sludge fertilizer that will prevent her garden from every being "certified organic" or point, in contempt, to the price of arugula at the farmers' market she frequented. These are the same folks who think of the real food movement as elitist and of farmers' markets as the playground of the wealthy. I've got to say that I don't understand these claims. I also don't understand people who buy arugula for $20 a pound but that's another post. In my mind, the Slow Food movement has nothing to do with being wealthy or well educated or whatever. It's all about getting back in touch with who we once were, with who our grandparents' were and who we want our children to be. It's about making a house a home and a kitchen something other than a decoration. It's about getting our hands dirty and our souls clean. And it's about bringing families together at meal time, about passing on skills, and building up the bank account. 1) Eat in Season: Load up at the peak of the season and, at farmers' markets, at the end of the day. Preserve what you can by canning, dehydrating and freezing. The paltry few greenhouse grown tomatoes that you'll find in May will cost you dearly. Wait until tomatoes are bursting out of everyone's ears to put up your pasta sauce for a cold February night. 2) Be Loyal: Find a few favored vendors and stick with them. I prefer to buy organic - though I'm not picky about it being certified. I find a few folks I like and buy from them regularly. I buy at their best prices and, because I'm a regular, I usually get extra goodies thrown in or dollars knocked off my total. 3) Spot a Bargain: Keep your eyes open for produce sales, peruse the bin of bruised apples, overripe peaches or Sapphira's softies. That's what you will use for jam, sauce, pie or fruit leather. Leave the pretty produce for eating straight out of the crisper. 4) Be a Freeloader: Every year, for the past three years, I've visited a seventy year old apple tree in September. It doesn't belong to me. Or even anyone I've ever met. Rather, it resides on the property of a generous but busy soul who hangs out on the same mothers' club message board as me. She answered my call for apples years ago and we've been produce partners every since. Sadly, her tree didn't produce much this year. That left me hungry for the plethora of apple desserts, apple breads, apple butter, apple sauce and such that I've gotten used to this time of year. So hungry that I posted on Freecycle, "Wanted: Apples". Not only did I end up with $70 worth of free apples, but they were grown far more locally than any apple to grace, even, my local's farmers' market. Another alternative - though I'm usually too chicken - is to knock on doors of folks with front yard fruit trees. You know the kind. The lonely apples lolling around the front grass of the persimmons smattered across the sidewalk. Ask if they mind if you pick their fruit and offer some canned yummies in return. 5) Get Dirty: Find out what grows in your area and clear a sunny space in our yard or place a pot in a warm spot on the balcony. Growing from seed is cheapest but even nursery starts beat the pants off, price-wise, any produce you'll find, be it in a chain grocery store or a farmers' market. Getting dirty is not limited to the garden, though. Dust off those hands and start kneading . . . or not, if you make no-knead bread. Experiment. Don't be afraid to try new things all the while remembering what actually worked. 6) Make Friends: I've written before about my snack swap group. A group of friends make homemade goods from healthy, often local and/or organic ingredients, and we swap them so that lunch packing and snacking is easy, good for us, and, minus all the packaging, good for the landfills. Friends are good for more than just muffins, though. A friend of a friend recently set up a homegrown produce swap on Hyperlocavore. Her goal? To recruit 10 local home gardeners and have us fruit and veggie self-sufficient within a couple of years. If that's a little too organized for you, just give your extra home grown produce to your friends and find out what happens. Just this summer, I've been gifted with zucchini, peppers, acorn squash, green beans, and tomatoes - all by recipients of my tomatoes and basil. Is it payback? Maybe. More than likely, those people recognized in me someone who appreciates fresh food grown with love. 7) Get Your Cook On: Pick up seasonal recipes - from farmers, friends, blogs. Find what your family likes and make it again and again. But be willing to eat what's in the fridge. Learn (or Google) what can be substituted for what. Then channel your great grandmother and go. 8) Make It a Habit: A few years ago, I shopped at Safeway like the rest of the country. 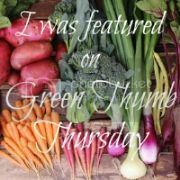 I gradually made the transition to farmers markets and then started supplementing with homegrown - mine, my neighbor's, my friend's. Just recently, we've almost stopped eating out completely. At first, I longed for the local taqueria or a plate of pasta made by someone with an Italian last name. The more we eat this way, though, the more of a habit it is. And the more the savings builds up. Perusing the checking account statement last month, my husband and I marveled at how much money we've saved by making and growing our own. It's a salary or, in this neck of the woods, a mortgage. Quite a lot either way. So get out there. 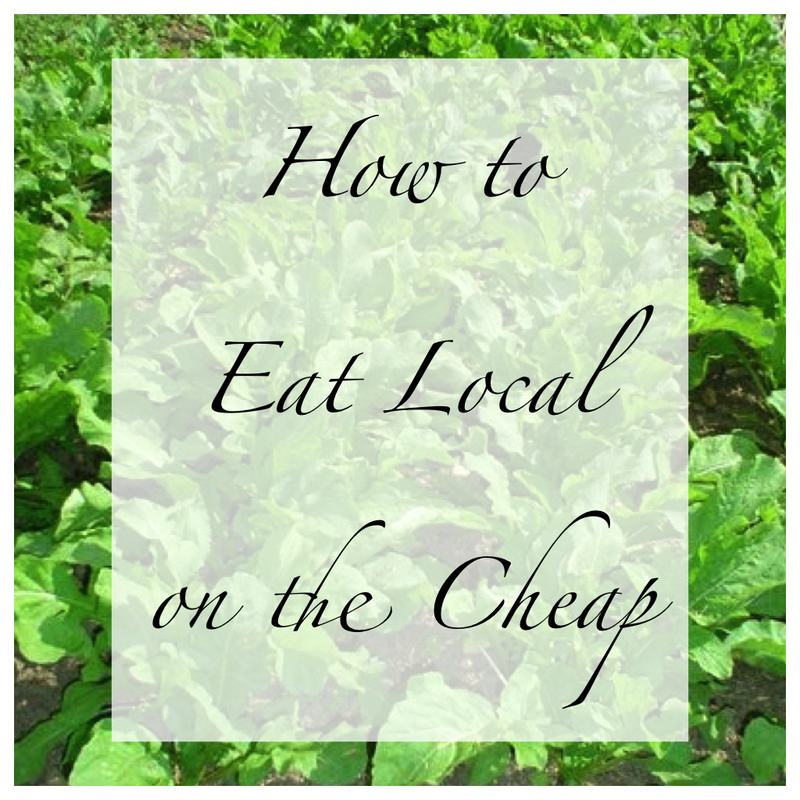 Embrace the Real Food movement for all the delicious, local and low cost wonderfulness that it is. Arugula for one, arugula for all. Fabulous post! I agree that baby steps are the way to go in transitioning away from doing most purchasing at the major grocery chain. And remember, for every $5 you spend with your local farmer, $9 of economic activity is generated in your local community. That can equal millions of dollars of growth right where you live, making your quality of life and job security better. It's more than price competition, it's sustainable communities! Dawn: Aboslutely, it's taken me three years of baby steps just to get where I am. Erin: We swap all kinds of things. Breads, bagels, muffins, crackers, dried fruit, fruit leather, sprouts, coleslaw with dressing, bean dip, shredded carrots, scones, you name it, we swap it. I do have a great saltine cracker recipe but cannot access it right now. I'll try to find it later. In the meantime, here's EnviroRambo's recipe from earlier this year. Karen: I love arugula too. ;-) I have a raised bed full of it in the backyard. It cost me $2.00 for the whole lot and constantly regrows itself. I love you! This is so beautiful and right on and doable and if I would have looked at the list two years I'd have said impossible. Now I think this is so fun and I want to get a big sack of flour and start making bread again too. Thank you for the inspiration. Again. Kale: Right back atcha, babe! And, like you, if I had thought about any of these things 2 years back, I'd have said no way! LOVE these lines: "It's all about getting back in touch with who we once were, with who our grandparents' were and who we want our children to be." Words to live by, indeed. Great post, GB! This is an amazing post. Beautiful words and common-sense advice. I'm very impressed with what you've managed to do. This year, I've dared my DH to give up out-of-season tomatoes (even the little cherry tomatoes he puts in his salads year-round). We had such delicious tomatoes this summer, I swear I won't miss the tasteless store bought ones! Alas, our farmers markets are considerably costlier than yours, but your tips may help...We belong to a CSA and get two huge bags of produce, bread, cheese, eggs for just $30. And thanks for the link to my post! PDeA and what you can do about it. There is more than junk in the mail. We Can't Afford to Wait! It's Autumn, and I'm cleaning "house"